*Sold as a Collectible, over 100 years old, may not fire , no returns if you dent the primer, trying to fire. Not 100 % mint, however excellent condition minor spots, nice patina, at a good price for this very early cartridge. One Cartridge. 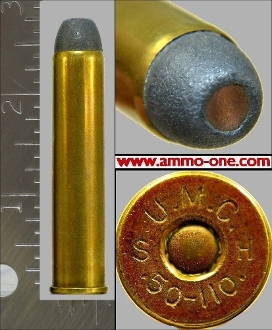 Not a Box: .50-110 *WCF* or .50-110 Winchester, produced by the early Union Metallic Cartridge Company (UMC) before merging with Remington Arms in 1912 . Factory produced using (THEN) new *SH* brass cases with “ U.M.C. S H .50-110.” Head-Stamp and loaded with a 300 grain *Copper Tubed Lead* projectile. *Copper Tubed Lead* projectile: a lead hollow-pointed projectile into which is inserted a thin, closed-ended copper tube. Its purpose was to preserve the bullet's aerodynamic shape. Sometimes the tube was charged with fulminate to create an explosive bullet. Also called "Express Bullet". History of the ..50-110 WCF cartridge:This cartridge was first design around 1887 as the 50 /100/ 450 Black Powder. Later many versions came 50-100, 50-105, 50-110, 50-110 High Velocity, all were just different Head Stamps and loadings in the same cartridge case. It later became the .50-110 Winchester High Velocity in Smokeless powder around 1910. Now loaded by a few smaller ammunition companies, with smokeless powder to the older black powder pressures for older firearms.